What home care will I need for my braces? The cost will vary depending upon the severity of the problem and what treatment will be used. There are a variety of financial arrangements available—from credit card payments to finance company agreements to a down payment with monthly installments. Also, some insurance plans now cover orthodontic treatment. You will get a chance to thoroughly discuss the cost of any orthodontic treatment. Generally, you can pay over the course of active treatment, and most orthodontists will offer many creative financial arrangements and do their best to make your treatment as affordable as possible. Orthodontic treatment at the right time can avoid later dental care complications, which is often more expensive than orthodontic treatment. Orthodontic treatment has improved greatly in the past few years. 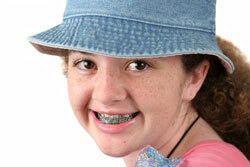 Generally, braces will cause your teeth to feel sore for a few days. This soreness should go away very shortly, and it shouldn’t be sharply painful. Recent advances in the types of wires that are used and the treatment options available have also minimized discomfort. The exact length of treatment will vary depending upon several factors, including the severity of the problem, the growth of the patient’s mouth and face, and if elastics and headgear are used as instructed. Some treatments can take only a few months, while others can last from 1-3 years. The exact length of your treatment can be discussed with your doctor. When you have braces, you need to take extra care to brush and floss each day. Food can get stuck in your braces, so it is very important to brush and floss each day. Typically, your doctor will show you how to brush and floss correctly with braces on and offer instruction and assistance so that you can easily brush and floss. Also, there are certain foods that you will not be able to eat with braces on. Sticky or hard foods (like caramel, tootsie rolls, hard candy or nuts) can break your braces, so you are not allowed to eat these. On most foods, simply using common sense on whether or not they are likely to get stuck in or break your braces will decide whether or not you should eat them. The improvement you can expect varies from person to person. Your improvement depends upon several factors, including the severity of your problem, the type of treatment you use, how your mouth and face grow and if your doctor’s instructions are followed. You can often see drastic improvement in the appearance of your smile, and you can also avoid later problems with dental care. Your doctor will be able to tell you exactly what you can expect, and what it will take to get there. No, you cannot be too old for braces. Healthy teeth can be moved at any age! As an adult, your mouth and face won’t be growing, so your treatment may differ slightly from a child’s treatment. The American Association of Orthodontists estimates that about 1,000,000 adults are receiving orthodontic treatment in the US and Canada. Patients of any age can benefit from orthodontic treatment! Crowded or incorrectly spaced teeth are often more difficult to clean. This can contribute to later dental problems like tooth decay, gum disease and tooth loss. Also, some cases can lead to unusual wear-and-tear on tooth surfaces, stress on the gums and bone that support the teeth, and misalignment of the jaw joints (this can lead to headaches and pain in the neck or face). Also, orthodontic treatment can greatly improve your smile. Many times the first thing that people notice when they look at you is your smile. Improving your smile can boost your self-esteem as well as enhancing your appearance.